Pakistan’s Foreign Minister Shah Mahmood Qureshi on Sunday said his government had reliable intelligence that India was planning to carry out aggression against Pakistan between April 16 and 20. Talking to reporters in the southern city of Multan, Qureshi said the ambassadors of the permanent members of the UN Security Council in Islamabad had been informed about “the plan” two days ago. “I am saying it with responsibility and I have a responsible position, I know each word I say would make headlines in the international press, ” he said. Contradicting New Delhi's claims, US personnel recently performed a physical count of Pakistan's F-16 fleet and found none of the jets missing, Foreign Policy cited two US officials who were privy to the situation. India had said one of its fighter jet pilots had downed a Pakistani F-16 while Islamabad said two of New Delhi's jets were downed during a dogfight on February 27. The report suggests that Indian officials "may have misled the international community about what happened that day." India had asked US officials to investigate Islamabad's use of F-16s, during a skirmish that took place a day after New Delhi's botched air strikes in Balakot area of Pakistan's Khyber Pakhtunkhwa province, saying it was a breach of the end user agreement between the US and Pakistan. A US defence defense told Foreign Policy that Pakistan had invited Washington to physically count its F-16 planes after the February 27 incident "as part of an end-user agreement signed when the foreign military sale was finalised." A US defense official said the agreement did not involve any terms limiting Pakistan's use of the F-16 jets. “It would be incredibly naive for us to believe that we could sell some type of equipment to Pakistan that they would not intend to use in a fight,” the official was quoted. The chief of Pakistan military's media wing in a statement earlier this week said that "Whether it was F16 or JF17 which shot down two Indian aircrafts is immaterial." "India can assume any (jet) type of their choice even F-16. Pakistan retains the right to use anything and everything in its legitimate self defence." India had lost a jet on Pakistani territory that resulted in the capture of one its Air Force pilots on February 27, who was then handed back to New Delhi within a week as a goodwill gesture by Pakistan. 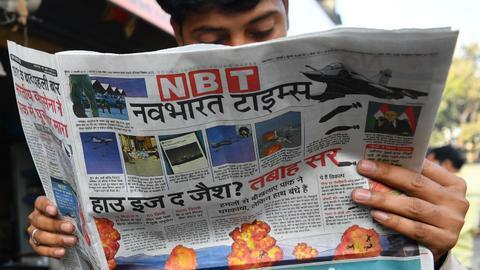 Another Indian helicopter was also lost resulting in the deaths of several Indian Air Force personnel. Pakistan and India traded fire in the disputed Himalayan region of Kashmir, leaving seven people dead — three Pakistani soldiers, a Pakistani villager, an Indian woman and a girl and a member of the Indian paramilitary troops, officials said on Tuesday. The fatalities were some of the highest since tensions flared between the rival nuclear-armed nations after a suicide bombing killed 40 Indian troops in India-administered Kashmir in February. Pakistan's military said Indian troops targeted its military positions overnight in the border town of Rakhchakri in Pakistan-administered Kashmir. One soldier was also injured in the clash, according to a statement from Pakistan's Inter-Services Public Relations (ISPR), the army's media wing. "The Pakistan army responded effectively. [There are] reports of casualties on the Indian side,” the statement added. In India, the army accused Pakistani troops of firing mortars and small-arms fire Monday along the disputed frontier, the highly militarised so-called Line of Control, hitting the sector of Poonch in India-administered Kashmir. It said Indian soldiers retaliated. Pakistan said on Thursday it had found no links between militants swept up in a recent dragnet and a suicide attack in India-administered-Kashmir last month. The announcement by Pakistan's foreign office comes after India provided Pakistani officials with a dossier containing a list of 90 suspected militants and 22 locations of alleged training camps. Islamabad said the dossier was based on "social media content". "The Indian paper contains 91 pages and 6 parts, out of which only part 2 & 3 pertain to Pulwama incident. Other parts are generalized allegations. Pakistan is focusing on those parts which relate to Pulwama incident," Islamabad's foreign office statement said. It added that "all aspects of the information provided by India have been thoroughly examined including the 'confessional' video of Adil Dar, 'claim' of responsibility for the attack, Whatsapp and Telegram numbers used to share videos and messages in support of Pulwama attack." "While 54 detained individuals are being investigated, no details linking them to Pulwama have been found so far," the foreign office said, referring to the area where the February attack took place India-administered Kashmir. "Similarly, the 22 pin locations shared by India have been examined. No such camps exist." The statement said Pakistan was "willing to allow visits, on request, to these locations" and also sought more information from New Delhi to continue the investigations. A paramilitary soldier in India-administered Kashmir shot dead three of his comrades early on Thursday, officials said, amid fresh violence raged in the restive territory. Police said the Central Reserve Police Force (CRPF) trooper opened fire on his colleagues with his service rifle at a camp in Udhampur, some 200 kilometres (125 miles) south of India-administered Kashmir's main city Srinagar. "He shot himself too and is in a critical condition at a hospital," Jammu police official MK Sinha told AFP, saying the man "may have been under the influence of drugs". According to rights group Jammu Kashmir Coalition of Civil Society (JKCCS), 20 Indian armed forces personnel killed themselves in 2018, the most in a decade. Since 2004 there have been 80 incidents of "fratricide" and 323 suicides, it says. 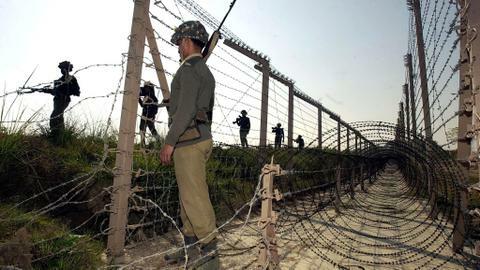 Separately on Thursday morning, an Indian soldier was killed when India and Pakistan again exchanged fire across the LoC near the southern area of Sundarbani, Indian army spokesman Lieutenant Colonel Devender Anand told AFP. The United States remains concerned about India-Pakistan tensions as the two countries' militaries remain on alert despite some de-escalation in the region, a senior US administration official said on Wednesday. 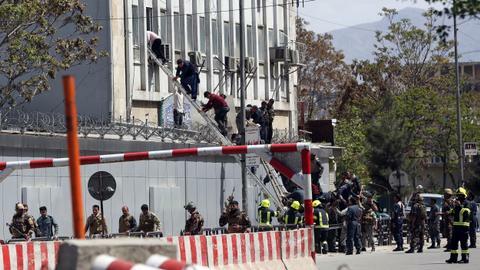 "We do still see the militaries on alert and so we realise if there, God forbid, would be another terrorist attack then you could quickly see escalation in the situation once again," the official told reporters on condition of anonymity. 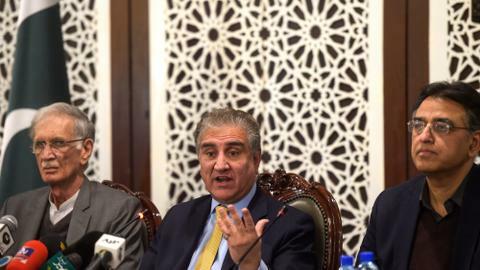 Pakistan Foreign Minister Shah Mahmood Qureshi told his Chinese counterpart of the "rapidly deteriorating situation" and rights violations in India-administered Kashmir, and called for India to look again at its policies there. Protests flared in parts of Indian-administered Kashmir on Tuesday after police said a man being questioned in connection with a security investigation had died in custody, the latest disturbances in one of the world's most militarised regions. Rizwan Asad Pandit, a chemistry graduate who taught at a private school, had been arrested as part of a "terror case investigation", a police spokesman said. Pandit's brother, Zulkarnain Asad Pandit, was sceptical that any investigation would reveal the truth. "We want an investigation of it but we know nothing is going to happen," the brother said. "We've all seen investigations for the last 20 years." Protesters threw stones at police in several parts of the Muslim-majority region following news of Pandit's death, with shops shutting in parts of the main city of Srinagar. Police responded with tear gas. The sparring between India and Pakistan last month threatened to spiral out of control and only interventions by US officials, including National Security Advisor John Bolton, headed off a bigger conflict, five sources familiar with the events told Reuters news agency. The way in which tensions suddenly worsened and threatened to trigger a war between the nuclear-armed nations shows how the disputed Kashmir region, which both claim and is at the core of their enmity, remains one of the world's most dangerous flashpoints. Major General Asif Ghafoor the spokesman for the Pakistani military said on Saturday that Pakistan Army soldiers had "shot down an Indian spy" drone along the Line of Control. The Indian quadcopter had crossed 150 metres into Pakistani airspace according to a tweet by the Director General of the Inter-Service Public Relations. The Line of Control is the de facto border dividing the disputed Kashmir region between India and Pakistan. India and Pakistan agreed on Thursday to go forward with a new border crossing and route for Sikh pilgrims to visit a holy shrine in Pakistan, a rare glimmer of cooperation after tension flared over the neighbours' decades-old Kashmir dispute. "Both sides held detailed and constructive discussions," the two countries said in a joint statement, after their officials met on Thursday at the Wagah checkpoint on their border to work out details of the crossing and the route. The meeting was the first between the nuclear-armed foes since a dogfight between their warplanes over the disputed Himalayan region last month led to the downing of an Indian aircraft and the capture of its pilot, since returned home. The talks were cordial and another meeting of technical experts is planned for next week, they said, adding that both sides had agreed to work towards soon making the route operational. 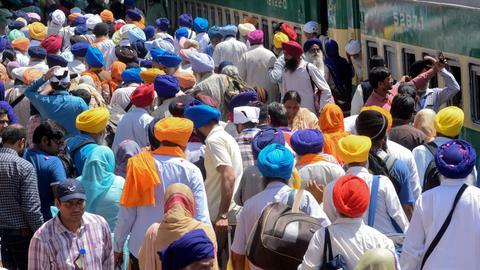 The Sikh minority community in India's northern state of Punjab and elsewhere has long sought easier access to the temple in Kartarpur, a village just over the border in Muslim-majority Pakistan. Many Sikhs see Pakistan as the place where their religion began: its founder, Guru Nanak, was born in 1469 in a small village near the eastern Pakistani city of Lahore. We spoke with Ramesh Singh Arora, chairman of Pakistan Sikh Council, who explains why the border crossing is important and what led to the breakthrough. Pakistan's air force says one of its fighter jets successfully test-fired a locally developed missile, described as a "smart weapon." An air force statement says a JF-17 multi-role fighter aircraft on Tuesday fired the new missile, which has "day-and-night capability to engage a variety of targets with pinpoint accuracy." A "smart" weapon is typically military language for a guided missile. Air Force chief Mujahid Anwar was quoted as saying that "Pakistan is a peace-loving nation but if subjected to aggression by adversary, we will respond with full force." China put on hold a request by Britain, France and the United States to add to the UN terror blacklist the leader of a Pakistan-based and proscribed militant group behind a suicide attack in India-administered Kashmir, diplomats said. It was the third time that the UN Security Council was considering a request to put Masood Azhar, leader of Jaish-e-Mohammad, on the UN sanctions blacklist, which would subject him to a global travel ban and assets freeze. Jaish-e-Mohammad has claimed responsibility for the February 14 attack in Kashmir that killed over 40 Indian troops. China has twice blocked –– in 2016 and 2017 –– attempts to impose sanctions on Azhar. In a note sent to the council, China said it needed more time to examine the sanctions request targeting Azhar, diplomats said. A Pakistani police official says Indian troops from across the frontier in the disputed Kashmir region have shelled the Pakistani-controlled sector, killing a 70-year-old man. Turkish President Recep Tayyip Erdogan discussed the latest developments along the Pakistan-India border with India’s prime minister over the phone, according to Turkish sources on Monday. In a statement, Turkish Presidency Directorate of Communications said the phone call between Erdogan and Narendra Modi also addressed the bilateral relations. Late February, Erdogan held a phone talk with Pakistan’s Prime Minister Imran Khan to discuss the recent tensions between the neighbours. On March 8, Erdogan also discussed the India-Pakistan tension with UN chief Antonio Guterres over the phone. Pakistan extended closure of its airspace for all transit flights till March 11, local media reported. A state-run Civil Aviation Authority had earlier announced to open the airspace from Saturday, a local TV channel reported, citing the CAA notification. The East and West-bound flights will have to use alternative routes to operate from and to Europe, North America, however some transit flights between the north and south will be allowed to fly over on some routes of the country's airspace. The airspace was completely closed for local and international flights on February 27, following an air combat between Pakistani and Indian air forces. India said on Saturday that its army is on a “strict vigil” for new attacks from Pakistan and renewed warnings to its neighbour to take concrete action against militant groups. An Indian foreign ministry spokesman responded with scepticism to reports of scores of militants being rounded up in Pakistan this week. “Our armed forces continue to maintain strict vigil and will remain determined in the defence of the nation and its citizens,” he said. “We have and we will continue to act with responsibility and maturity,” he added. Pakistani Prime Minister Imran Khan said no militant group would be allowed to operate on Pakistani soil and carry out attacks abroad, days after his government began a crackdown against militant organisations. "This government will not allow Pakistan's land to be used for any kind of outside terrorism," Khan said on Friday while addressing a public rally in southern Pakistan. "We will not allow any militant group to function in our country now." China urged India and Pakistan to move on from the recent escalation on the conflict between the two countries, according to media reports. Talking to reporters in Beijing, Chinese Foreign Minister Wang Yi said that New Delhi and Islamabad should "quickly turn the page" and convert the present tensions into "an opportunity for the long term improvement" in their relations, the Indian news agency Press Trust of India reported. "China hopes Pakistan and India will transform the crisis into opportunity and meet each other halfway," Wang said. Saudi Arabia has offered its "full cooperation" in defusing escalating tensions between nuclear rivals Pakistan and India. The offer was made by Saudi State Minister for Foreign Affairs Adel al-Jubeir who arrived in Islamabad on a day-long visit to quell rising tensions between the two South Asian neighbours. Jubeir, who is visiting Pakistan on the directive of Crown Prince Mohammad bin Salman, met his Pakistani counterpart Shah Mehmood Qureshi, said a statement from Pakistan's Foreign Ministry. Qureshi welcomed the crown prince's rare offer to mediate between Pakistan and India, which follows promised multibillion-dollar Saudi investment in the two countries in recent months. Pakistan has taken control of182 schools and detained more than 100 people as it intensifies its crackdown on banned militant organisations, the interior ministry said on Thursday. "Law enforcement agencies have taken 121 people under preventive detention as of today," the ministry said in a statement, adding that religious schools, hospitals and ambulances were taken over. A grenade explosion at a bus stand in the southern Jammu city of India-administered Kashmir killed one and wounded at least 29 people on Thursday, police said. "I request everybody to maintain calm," Jammu's police chief M K Sinha told reporters at the site of the blast. "We are chasing all leads." The reason for the blast was unknown, but was called an "attack" by a senior Indian minister. "The grenade attack in Jammu is condemnable," said Finance Minister Arun Jaitley on Twitter. Jammu city is the winter capital of India-administered Kashmir. Also on Thursday, Indian police claimed to have killed a rebel fighter in Kashmir's Handwara area. Neha Poonia joins TRT World for more on the story. Indian and Pakistani soldiers shelled military outposts and villages along their highly militarised frontier in disputed Kashmir on Wednesday, in new violence despite stepped-up diplomatic efforts by the rival countries to ease tensions. The two armies accused each other of initiating the artillery and mortar fire and small-arms gunfire. Reuters reviews and releases high-resolution satellite images produced by Planet Labs Inc, a San Francisco-based private satellite operator. The images show a seminary, formerly operated by the Jaish-e-Mohammad (JeM) outfit in northeastern Pakistan, appear to be still standing days after India claimed its warplanes had hit the outlawed group's training camp on the site and killed a large number of militants. The image shows no discernible holes in the roofs of buildings, no signs of scorching, blown-out walls, displaced trees around the madrasa or other signs of an aerial attack. Pakistan's Interior Ministry says authorities have arrested dozens of suspects, including the brother of the leader of the outlawed JeM group that India blames for the February 14 suicide bombing in India-administered Kashmir that triggered the crisis. The interior ministry said it arrested 44 suspects. Among them was Mufti Abdul Rauf, the brother of JeM leader, Masood Azhar. The ministry said the brother was among suspects listed in a file that India gave to Pakistan over the weekend. The navy said in a statement on Tuesday that the Indian submarine wasn’t targeted, “keeping in view Pakistan’s policy of peace” under which Islamabad wants to de-escalate tensions with New Delhi. A navy official says the warning was “communicated” to the submarine during Monday’s encounter. The submarine then moved away. He didn’t elaborate and spoke on condition of anonymity to talk to reporters. India has yet to confirm or deny the incident. Amid confusion over the number of casualties in last week's air strikes by India on Pakistan, the Indian air force chief said Monday they only count the targets hit and not the number of people killed. "IAF [Indian Air Force] is not in a position to clarify the number of casualties. The government will clarify that. We don't count human casualties, we count what targets we have hit or not," Birender Singh Dhanoa said addressing a news conference in the southern city of Coimbatore, local daily Hindustan Times reported. The remarks came a day after leader of India's ruling right-wing Bharatiya Janata Party, Amit Shah said "over 250 terrorists" were killed in air strikes. Pakistan fully reopened its airspace, authorities said, days after it closed its skies to all air travel, leaving thousands stranded worldwide as tensions with India soared. The decision to close the airspace came last Wednesday. The Samjhauta Express train service between Pakistan and India resumed its operations from Lahore on Monday. The announcement to resume the train service, which was suspended on February 3 due to increasing tensions between the two neighbouring countries, was made on Sunday, a day after Pakistan released an Indian Air Force pilot, arrested during a confrontation. The Samjhauta (Urdu for ‘’Agreement’’) Express train service began on July 22, 1976 under the Shimla Agreement that settled the 1971 war between the two nuclear-armed nations. The train normally runs between the two countries on Mondays and Thursdays. On the Indian side, the train runs from Delhi to Attari and on the Pakistan side, from Lahore to Wagah. Funerals were held for two Pakistani soldiers killed during gunfire between armies of Pakistan and India along the de facto border, Line of Control or LoC that separates disputed Kashmir. Funeral prayers were also offered for Shakir Ullah, a Pakistani prisoner who was stoned to death by inmates in an Indian jail, in northern Pakistan's Sialkot city, Geo TV reported. India handed over his body to Pakistan on Saturday at the same Wagah border where Pakistan freed an Indian pilot downed and captured by Pakistan last week. Meanwhile, residents near LoC said it was quiet overnight, the first lull since a dangerous escalation last week bringing the two nuclear-armed rivals close to full-out war. Prime Minister Imran Khan had a telephone conversation with UK's Prime Minister Theresa May, in which Khan apprised May of Pakistan's perspective on the developments since the Kashmir suicide bombing incident, a foreign ministry spokesman said. May welcomed Khan's decision of releasing the Indian pilot, which has been widely appreciated by the international community. She mentioned the need for both India and Pakistan to de-escalate. She added that UK was in touch with both sides in this regard. Also on Sunday, hundreds of people gathered in Pakistan's eastern city Lahore to protest against India. The demonstration came after India's home ministry issued a notification against Kashmir's social, political and religious group Jamaat-e-Islami, accusing the group of supporting armed revolt in the region. The Lahore protest was organised by political party Jamaat-e-Islami Pakistan. Pakistan's foreign ministry says the world's largest body of Muslim-majority nations has adopted a resolution urging India and Pakistan to de-escalate tensions and resolve their issues "through peaceful means." The ministry said in a statement on Saturday that at the end of a meeting in Abu Dhabi, the 57-nation Organization of Islamic Cooperation or OIC "reaffirmed its unwavering support for the Kashmiri people in their just cause." It said the OIC expressed concern over this past week’s "Indian violation of Pakistani airspace; affirmed Pakistan's right to self-defence; and urged India to refrain from the threat or use of force." The resolution came a day after Pakistan's foreign minister skipped the meeting to protest the host UAE's decision to invite India, a non-member. In a separate statement, OIC said it "condemns recent wave of Indian terrorism" and "mass blinding of Kashmiris" in India-administered Kashmir. India has handed over the body of a Pakistani prisoner who was beaten to death by inmates at an Indian jail last month apparently in retaliation for a February 14 suicide bombing in India-administered Kashmir that killed over 40 soldiers. Pakistani government officials say border guards received Ullah's body on Saturday at the same Wagah border crossing in the eastern city of Lahore from where an Indian pilot was handed over to Indian officials a day before. Remains of Pakistani prisoner #Shakirullah, stoned to death in Indian jail repatriated to #Pakistan. no response to #Pakistan’s request for post-mortem-judicial inquiry. Failure to protect basic human right to life of Pakistani in its prison raises questions #India must answer. Turkey's President Recep Tayyip Erdogan hailed Pakistan for releasing Indian pilot, hoping India will "respond to the positive step in the same way". "It's an admirable step for our Pakistani brothers to release an Indian pilot. Our hope is that our Indian friends will respond to this positive step in the same way," he said. Erdogan said Turkey is ready to do its part to de-escalate tension between Pakistan and India. "There is no use in escalating the tension and fueling the fire." Indian and Pakistani soldiers again targeted each other's posts and villages along their volatile frontier in disputed Kashmir, killing at least six civilians and two Pakistani troops, officials said on Saturday. Tensions have been running high since Indian aircraft crossed into Pakistan on Tuesday, carrying out what India called a pre-emptive strike against militants blamed for a February 14 suicide bombing in India-administered Kashmir that killed 40 Indian troops. Pakistan retaliated, shooting down a fighter jet on Wednesday and detaining its pilot, who was returned to India on Friday in a peace gesture. Fighting resumed overnight Friday. Pakistan's military said two of its soldiers were killed in an exchange of fire with Indian forces near the Line of Control that separates Kashmir between the rivals. It marked the first fatalities for Pakistani troops since Wednesday, when tensions dramatically escalated between the nuclear-armed neighbours over Kashmir, which is split between them but claimed by both in its entirety. Three civilians were killed on each side in the latest escalation. TRT World's Hassan Abdullah has more from Islamabad. A pilot shot down in a dogfight with Pakistani aircraft returned to India on Friday, after being freed in what Islamabad called a "peace gesture" following the two countries' biggest standoff in years. Wing Commander Abhinandan Varthaman, downed on Wednesday over Kashmir, crossed into India at the Wagah crossing point, hours later than expected and sporting a black eye. "He was arrested when his military jet MIG-21 crashed in Azad Jammu & Kashmir [Pakistan-administered Kashmir] after being shot down by Pakistan Air Force for violating Pakistani airspace on February 27, 2019," Pakistan foreign ministry statement said. "While in captivity, he was treated with dignity and in line with international law. Prime Minister of Pakistan Mr Imran Khan announced his return as a goodwill gesture aimed at de-escalating rising tensions with India," the statement said. Ahead of his release, Varthaman in a video statement released by Pakistani media, lauded Pakistani army and accused Indian media of sensationalising news and misleading people. "Small issues are presented in incendiary way that misleads people," Varthaman said. The released pilot will undergo a medical check-up, Indian officials said. "This check-up is mandated particularly because the officer has had to eject from an aeroplane," Air Vice Marshal R G K. Kapoor told reporters near a border crossing in India's northern state of Punjab. Pakistan plans to lodge a complaint against India at the United Nations, accusing it of "eco-terrorism" over air strikes that damaged pine trees and brought the nuclear-armed nations to blows, a government minister said on Friday. Indian warplanes on Tuesday bombed a hilly forest area near the northern Pakistani town of Balakot, about 40 km from India's de facto border in the disputed region of Kashmir. New Delhi said it had destroyed a militant training camp and killed hundreds of "terrorists". Pakistan denied there were any such camps in the area and locals said a crow was killed and an elderly villager was hurt. "What happened over there is environmental terrorism," Climate Change Minister Malik Amin Aslam told Reuters, adding that dozens of pine trees had been felled. "There has been serious environmental damage." India has banned a largest social, political and religious group in India-administered Kashmir in an ongoing crackdown against rebels seeking the end of Indian rule in the disputed region. India's home ministry issued a notification against Jamaat-e-Islami on Thursday night, accusing the group as "unlawful association" and supporting militancy in the region. Police have already arrested at least 400 leaders and activists, mainly from the Jamaat-e-Islami, which seeks self-determination for the Himalayan region, which is divided between India and Pakistan since 1947 but claimed by both in its entirety. Pakistan's Civil Aviation Authority said airspace closed this week amid tensions with neighbouring India would reopen for commercial flights from 1100 GMT on Friday. Pakistan's Foreign Minister Shah Mahmood Qureshi said a downed Indian pilot will be handed over to Indian authorities later on Friday in an effort to de-escalate a crisis between the nuclear armed neighbours. "As a gesture of peace and to de-escalate matters, the Indian pilot who is under arrest with us will be released today in the afternoon at the Wagah border," Qureshi told parliament, referring to the border crossing near Pakistan's eastern city of Lahore. The pilot, identified as Wing Commander Abhinandan Varthaman, became the human face of the flare-up over the contested region of Kashmir following the release of videos showing him being captured and later held in custody. Turkey, US, China, European Union and other powers have urged restraint from the two nations, as tensions escalated following a suicide car bombing that killed at least 40 Indian paramilitary police in Indian-controlled Kashmir on February 14. A day after cross-border air raids escalated tensions with nuclear-armed neighbour Pakistan, Prime Minister Narendra Modi said India will fight as one nation. Speaking on Thursday to his party workers across the nation in a video conference, he said the enemy wants to destabilise the country. "When the enemy tries to destabilise India, then one of their motives is to ensure that India's development is stalled. "We must show that the nation will not stop. Our soldiers are defending our borders. We must also work like soldiers and continue our work," local broadcaster India Today reported. "India will live as one; India will work as one; India will grow as one; India will fight as one," he added. He went on to say: "We must ensure that our enemy should not get a chance to point fingers at us." Pakistani Prime Minister Imran Khan said he will ask Turkey's President Recep Tayyip Erdogan to help defuse tension between Pakistan and India. “I am going to talk to [Turkish] President [Recep Tayyip] Erdogan, and I will request him to play his role in this connection,” Khan told a joint session of the parliament summoned after both countries claimed to have shot down each other's jets. He said his country wants peace and this should not be considered a weakness, adding that he had attempted to contact Indian Prime Minister Modi on Wednesday to call for deescalation. "Prime Minister Imran Khan is ready to telephone Prime Minister Modi to defuse the ongoing tensions between the two countries," Foreign Minister Shah Mahmood Qureshi told local broadcaster Geo News. "Is he (Modi) ready for that?" he asked. Lt. Col. Devender Anand, an Indian army spokesman, said Pakistani troops later Thursday attacked forward posts along the Line of Control calling it an "unprovoked" violation of the 2003 cease-fire accord. He said Indian soldiers were responding to the ongoing Pakistani multiple attacks along the highly militarised de-facto frontier. Pakistani soldiers also attacked Indian positions overnight, the army spokesman said earlier, but described its intensity as "lesser" than previous nights. He said no casualties involving soldiers were reported so far in fighting since Wednesday night. Pakistan said it will release a captured Indian pilot in a "peace gesture", taking a step towards rapprochement as clashes between the nuclear-armed rivals ignited fears of a disastrous conflict. "As a peace gesture we are releasing the Indian pilot tomorrow," Prime Minister Imran Khan told a joint session of parliament. Qureshi said his country is prepared to return the Indian pilot shot down and captured on Wednesday, but only if it helps ease the crisis with its neighbour, India. "We are willing to return the captured Indian pilot if it leads to de-escalation," he was quoted as saying by Pakistan media. He added that, as a sign of the crisis easing, India had handed over its file to Pakistan on the deadly suicide bombing in India-administered Kashmir on February 14, which triggered the latest upsurge in tension. India and Pakistan exchanged gunfire through the night into Thursday morning in the disputed Himalayan region of Kashmir, a day after Islamabad said it shot down two Indian warplanes and captured a pilot. There were no immediate reports of casualties, though jet fighters roared overhead through the mountainous region as villagers along the so-called Line of Control fled to safety. Meanwhile, members of Indian Prime Minister Modi's Bharitiya Janata Party called for more military action, suggesting the conflict still could worsen. 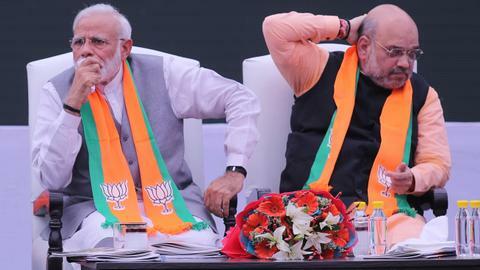 Modi himself held a teleconference rally Thursday ahead of national elections, warning that "India's enemies are conspiring to create instability in the country through terror attacks." Khan had called for talks between the two nuclear-armed rivals in a televised address Wednesday, saying: "Considering the nature of the weapons that both of us have, can we afford any miscalculation?" Both Indian and Pakistani officials reported small-arms fire and shelling along the Kashmir region into on Thursday. However, Indian army spokesman Lt. Colonel Devender Anand described the intensity of the firing as "lesser" than previous nights. Schools in Pakistan-administered Kashmir also remained closed. India on Thursday demanded the release of one of its air force pilots who was in a jet shot down by Pakistan's warplanes. Wing Commander Abhinandan Varthaman was captured by villagers in Pakistan-administered Kashmir after his MiG 21 crashed after being shot. India's foreign ministry demanded the pilot's immediate release. The pilot is currently in Pakistan military custody. The international community has continued to urge restraint as the crisis between the countries intensifies. TRT World's Hasan Abdullah reports from Pakistan's capital Islamabad with the latest. Khan repeats his calls on Wednesday that he is ready to cooperate with India over the Kashmir suicide bombing investigation. "Pakistan's plan was that there should be no casualties or damage, only to show Pakistani capability," said Khan. He added, “we need to use wisdom and sense to resolve the dispute with India”. Pakistan's prime minister stated that both sides can't afford miscalculation with weapons they have and urged "better sense to prevail". In a statement, the Pentagon said Shanahan had spoken with senior US military officials about the situation. "Acting Secretary Shanahan's focus is on de-escalating tensions and urging both of the nations to avoid further military action," the statement added. Turkish Foreign Minister, Mevlut Cavusoglu has called for a de-escalation of tensions and a resolution on the Kashmir conflict. Cavusoglu said that he has told Pakistan that Turkey is willing to mediate between India and Pakistan. Turkish foreign minister added that Ankara ready to play its part to ease tension between Pakistan, India. India says it lost a combat jet and the pilot was MIA while it foiled an attack by Pakistan military planes over the disputed region of Kashmir. Indian Foreign Ministry spokesman Raveesh Kumar said Indian planes engaged with Pakistan jets and brought one of them down. "In this engagement, we have unfortunately lost one MiG 21. The pilot is missing in action. Pakistan has claimed that he is in their custody. We are ascertaining the facts," Kumar told reporters. Pakistan has denied losing any of its planes. Pakistan closed its airspace Wednesday, the country's Civil Aviation Authority (CAA) and the military said, as fears spiked of an all-out conflict with nuclear-armed neighbour India. The CAA tweeted that it "has officially closed its airspace until further notice", while a Pakistani military spokesman said the decision had been taken "due to the environment." A CAA source said all airlines had been notified. India had earlier announced it was closing several cities in India and India-administered Kashmir. Pakistan says it captured an Indian pilot after shooting down two Indian fighter jets over Pakistan-administered Kashmir. He is in hospital for medical treatment, army spokesman said. Pakistan’s state media Wednesday published a video showing the pilot. It showed a blindfolded man in an Indian Air Force uniform, his face bloodied, with his hands tied behind him, as a soldier interrogates him. In a photograph, which has also been confirmed by security sources, the pilot can be seen flanked by Pakistani military personnel. Pakistan military spokesman Major General Asif Ghafoor said Pakistan does not want to escalate its crisis with India, nor does it want to go to war. He also discredited Indian media reports of Wednesday morning's incident. "Indian media says a Pakistani F-16 was downed - but Pakistan has not used any F-16s so far, nor has any been shot down," Ghafoor said. "Army, government and people of Pakistan have always conveyed a message of peace. Both countries have the capacity, but war is the failure of policy. Showing our will and resolve, we do not want to escalate and want to follow a path of peace. Nothing is solved through war and no conflict has ever been settled through war." He added that the action Pakistan has taken is in "self defence." "It is up to India now to go the way we have gone. Which is the way of peace. If they respond with aggression, we will be forced to respond," he said. Pakistan shot down two Indian Air Force planes in its airspace in Kashmir on Wednesday, a military spokesman said, adding that one Indian pilot had been captured. "PAF [Pakistan Air Force] shot down two Indian aircrafts inside Pakistani airspace," tweeted military spokesman Major General Asif Ghafoor, adding that one aircraft had fallen in Pakistan-administered Kashmir, while the other crashed in India-administered Kashmir. An Indian air force plane crashed in India-administered Kashmir on Wednesday, according to an Indian official. Two pilots and at least one civilian were killed here, according to an Indian official. The official says the incident occurred after at least three Pakistan combat jets entered India-administered Kashmir airspace. The official said Indian air force jets scrambled and intercepted the Pakistan planes, which then flew back. TRT World spoke to General Naeem Khalid Lodhi, Pakistan's former Minister of Defence. Pakistan's foreign ministry on Wednesday said strikes were carried out against a "non-military target" to avoid loss of life and demonstrate Pakistan's right and ability to defend itself. "We have no intention of escalation, but are fully prepared to do so if force into that paradigm," the foreign ministry said. Earlier on Wednesday, Pakistani police said mortar shells fired by Indian troops from across the frontier in the Himalayan region of Kashmir struck homes, killing six civilians and wounding several others. Local police official Mohammad Altaf says six people, including children, were killed Wednesday in Kotli village in Pakistan-administered Kashmir. TRT World's Hasan Abdullah reports from Pakistan's capital, Islamabad. Pakistani and Indian troops deployed in Kashmir often trade fire. The region is split between Pakistan and India and claimed by both in its entirety. Indian airline Vistara said on Wednesday it had suspended flights to four cities in the region in India and India-administered Kashmir. "Due to airspace restrictions, flights to and from Amritsar, Srinagar, Chandigarh and Jammu are currently on hold," Vistara said. TRT World speaks to New Delhi-based journalist Ishan Russell. The latest civilian casualties came a day after tensions escalated sharply following a pre-dawn air strike by India that New Delhi said targeted a terrorist training camp. Pakistan says Indian warplanes violated its airspace and dropped bombs near the town of Balakot, but there were no casualties. Earlier, India's Foreign Minister Sushma Swaraj said her country wants to avoid any "further escalation of the situation." She stressed during a visit to China on Wednesday that "no military installations were targeted" in the air raid, describing the operation as a "pre-emptive strike" to prevent another attack in India by the Pakistan-based Jaish-e-Mohammad (JeM) group. Tuesday's air raid came after India threatened retaliation over the February 14 suicide bombing, claimed by JeM, that killed 40 Indian troops in India-administered Kashmir.